This is Skate Canada's learn-to-skate program. It was developed by experts to teach the fundamentals of skating in a progressive and sequential manner. Designed for beginners of all ages, the focus is on fun, participation and basic skill development. Participants earn badges as skills are mastered. Skaters are taught in a group lesson format by a NCCP certified professional coach, assisted by trained Program Assistants. Bridge program for our more advanced CanSkaters to our StarSkate program. Participants will attend small group lessons with certified professional coaches working on individualized figure skating skills. Skaters will also participate in the Session #1 CanSkate circuits in order to complete their CanSkate training. There may be oportunities for our skaters if they test high enough to participate in StarSkate competitions and testing. Private lessons at this level are encouraged. 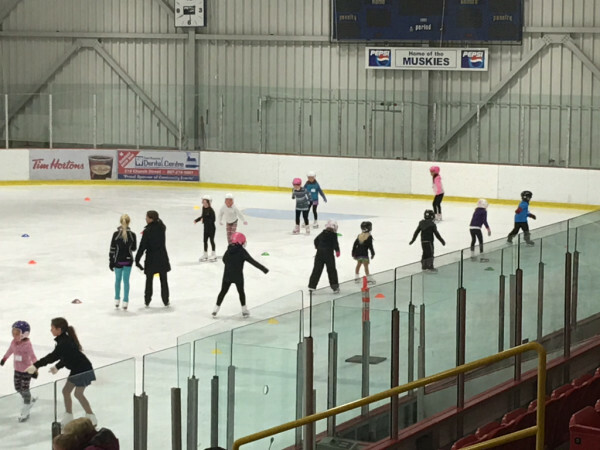 Our CanSkate program held in Emo, Ontario. Designed for beginners of all ages, the focus is on fun, participation and basic skill development. Participants earn badges as skills are mastered. Skaters are taught in a group lesson format by a NCCP certified professional coach, assisted by trained Program Assistants. This skating time is in addition to the CanSkate program for the more serious skaters. Skaters must schedule lessons with their own choice of coach. Skills, Tests, Achievement, Recognition – this is what the STARSkate program stands for. This program offers opportunities for skaters to develop basic figure skating skills taught in group and private lesson format in four different areas: dance, skills, free skating and interpretive skating. Skaters have the option of taking Skate Canada Tests and earning awards and incentives.